The Apathy theme displays your content via a crisp, three-column dynamic layout that is extremely lightweight and casual. 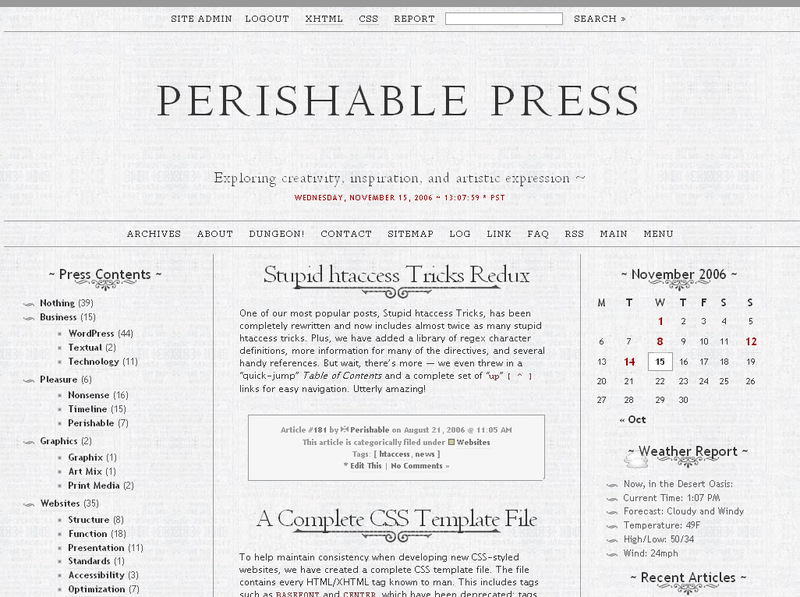 The Apathy theme emulates a digital newspaper, with information presented in traditional newsprint format. Apathy validates as XHTML strict, and even better: Apathy displays with high fidelity in all modern browsers. If you are focusing on text-based content and strive toward coherent, concise presentation, the Apathy theme will serve you well..
Apathy version 2.7 is officially released! The new version features a triple-loop, liquid-width, three-column layout as well as a completely redesigned code base and improved graphical interface. Further, Apathy 2.7 includes many new configuration options and provides detailed comments and installation instructions. Plus, Apathy employs strictly valid XHTML, nearly valid CSS, universal fonts, and browser-safe colors. Check it out! Version 1 of Apathy is great, but when will version 2.7 be packaged? I notice that’s what is running here (via the CSS source) and that it too is GPL software… Is it packaged up anywhere? Actually, you are the first person to ask about the new version of the Apathy theme. And, because I told myself that I wasn’t going to worry about packaging the latest version until someone actually requested it, I guess now is the time for the official release! Although I can’t specify exactly when the new version will be available, I plan to work on it tonight and tomorrow, and then hopefully it will be available by Tuesday or Wednesday..
Woohoo! I can’t wait. I’ve been searching for several days for a theme I liked enough to keep using, and the elegance of Apathy is fantastic! Oh I’m patient. I’d rather it be delayed some than be rushed, after all. Your patience has served you well, Rick Beckman! I am pleased to announce the official release of Apathy version 2.7! The triple loop required some wrangling, but everything now has been generalized and commented with explanations, etc. — Lord willing, you will be up and running in no time! Super theme. I’ve adopted it. Unfortunately I have many users who use a 800×600 pixel resolution. Is there a way to make the center scale as they size so the Calendar doesn’t imped onto the center section. How do I make the center section so it uses only the amount of space that is left from the left and right sections? Very easy! Open the Apathy theme’s style.css file, locate the div.content selector, and change the current value (333px) of the min-width property to something more appropriate for 800×600 resolutions. Given the dimensions of the two side columns, I would agree that a min-width value of 120px suits you perfectly.. ;) Thank you for bringing this to our attention. Have you given any thought to adding widget support? Hmmm… not a bad idea! Perhaps I will look into it.. ;) Thanks, Steve!